So last week I took a time out from blogging on watersports to write about a dynamic warm up for those activities. If you missed it, find it here. Summer continues here in Ontario, which I am very thankful for as we can continue to enjoy water sports on our lakes and rivers. This week let’s look at canoeing and kayaking, two more fun activities to do on the water. Canoeing and kayaking involve paddling a small craft through water. They are low impact activities that can improve your cardiovascular fitness, flexibility and strength. Both can be done as a hobby, a competitive sport or just for fun. A canoe is an open vessel and the person can sit or kneel inside. A single-bladed paddle is used to push the craft through the water. There are a few exceptions where a canoe may be enclosed and a kayak is open. It all depends on their intended use. · Flatwater recreation – this is what most people imagine when they think of canoeing or kayaking. Gentle paddling down a calm river or on a calm lake or sea. · Whitewater – paddling on varying grades of rapids. Much more adventurous and requires much more fitness and skill. If you are a beginner, it is best to join a club and to take lessons. Ideally you will be taught how to paddle properly and you will become more aware of safety issues on the water. Be a competent swimmer – as you will most likely flip, you need to be comfortable in the water. Brush up on your swimming if you have to. · Learn how to paddle from experienced teachers. Contact your local club. 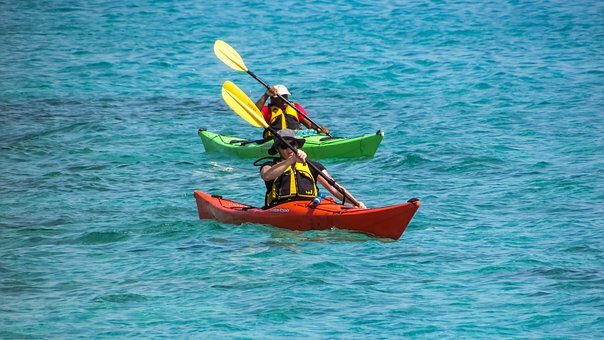 · Make sure your preparation and skills are adequate for the planned paddling activity. · Be visible to other crafts. Put reflective tape or fluorescent paint on your helmet, life jacket and canoe or kayak. · Make sure you know about potential hazards in the proposed waterway. Seek local knowledge if paddling in a location for the first time, consider air and water temperature, currents, tides and wave action. · Check weather conditions before you paddle. · Don’t paddle alone. Always tell someone about your plans, including where you intend to paddle and when you expect to be back. · Dress for the conditions. Apply 30+ SPF sunscreen (or higher) to all exposed areas of skin. · Avoid dehydration. Take plenty of water to drink. · Keep your equipment in good repair.